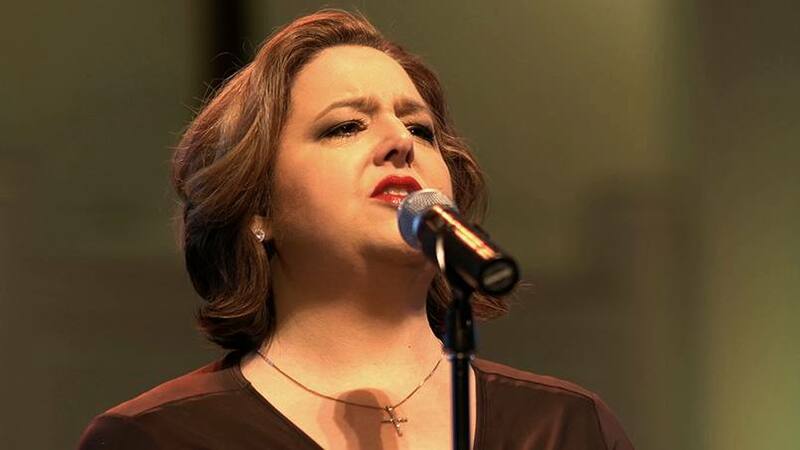 When Becky Loar injured her voice, she was alarmed by the prospect of not being able to sing. But her care team at Mayo Clinic provided Becky with the treatment she needed to hit the high notes once again. When Becky Loar entered a recording studio in July 2016, it was the culmination of a goal the Vero Beach, Florida, native had almost given up hope of achieving. A voice injury had threatened to sideline Becky's music career. "I realized I was hoarse all the time. Then one day I was vocalizing, and it just wasn't there. I knew in my gut something was wrong," Becky says. "Singing is all I've ever known and done, and all I want to do." Thanks to the specialty care provided by Mayo Clinic laryngologist Amy Rutt, D.O., and the rest of Becky's care team at Mayo Clinic's Florida campus, Becky was able to regain her voice. She recently released an album titled "How Can I Keep From Singing," which includes a dedication to her Mayo Clinic care team in the liner notes. Becky grew up with a love of music, singing in the church choir as a child. She went on to earn degrees in voice and opera performance, and then delight audiences across the country with timeless classics like Handel's "Messiah," Bach's "Magnificat," and Mozart's "Exsultate, Jubilate." Eventually Becky married, became a mom and started teaching music at two universities in Jacksonville, Florida. She also recorded and released a five-track album of contemporary Christian music and was excited about the possibility of a second. But that ambition was placed in limbo when Becky began to have problems with her voice. It began when Becky's son was diagnosed with a hearing impairment. She admits she struggled with communication at first. "As his hearing loss progressed, I think my speaking voice got louder and louder, and my mom voice took over," she says. "I thought if I just talked louder, he would hear me better. But that was the catalyst for the strain on my voice." One evening in late 2015, Becky called out to her son that it was bath time, unaware that he'd removed his hearing aids. When he didn't answer, Becky raised her voice. Then she heard a pop. She decided she needed to have her voice checked. Becky met with an ear, nose and throat specialist near her home who simply told her to rest her voice. After a week of not speaking, Becky still wasn't feeling right and sought a second and third opinion. "Issues that singers face are different than typical speech problems," Becky says. "As a singer and a voice teacher, I'm hyperaware of what's going on with my voice. I wanted someone who was skilled in all aspects of voice." She felt at ease when she met with Dr. Rutt at Mayo Clinic. A laryngologist, Dr. Rutt specializes in disorders of the larynx — also known as the voice box. "She was not your normal ear, nose and throat doctor," says Becky, noting Dr. Rutt's experience in music. "I liked her style. And I liked that she had a whole team of people to work with me." Dr. Rutt found that Becky had a polyp on one of her vocal cords (sometimes called vocal folds). She advised Becky to undergo surgery to remove it. Though some polyps may heal on their own, they usually require many months to do so. If left untreated, there was a possibility that the polyp could get worse. Or another polyp, called a reactive lesion, could form on the opposite vocal cord. But Becky dreaded the prospect of surgery. "I wondered what it was going to feel like," says Becky. "How would it be? Was I still going to be able to sing? It was terrifying." Despite her concerns, Becky opted to go through with the surgery. She recalls the fear subsiding as she lay on the operating table before the anesthesia took over. "I trusted Dr. Rutt and her team," she says. "I knew I was in good hands." When she awoke, the polyp had been removed. After one week of complete voice rest and six weeks without singing, Becky began voice rehabilitation with Stacey Menton, a Mayo Clinic speech language pathologist who is also a singing voice therapist. "Stacey is unique. Being a singing voice specialist and an opera singer, I trusted everything going into a therapy session with her," Becky says. "I knew she would guide me properly." The day she was allowed to sing again, Becky was pleasantly surprised. Although her voice wasn't as strong as it had been before surgery because the vocal muscles still needed time to strengthen, she could definitely sing. "I began vocalizing, and when I hit a high C, it was there!" she says. "I was excited because I had just started therapy and the muscles had to relearn what they were trained to do, but it was there." Soon Becky was back to teaching, and she began planning her return trip to the recording studio. "I was so nervous before I went to Nashville. I went to see Dr. Rutt to make sure it was OK to do this recording and that I wasn't going to hurt myself," Becky says. "Dr. Rutt, the whole team, was very encouraging to me." The recording was a success, and now Becky is looking forward to a future filled with more music. "It was so satisfying to record this album because had I not had the surgery, I wouldn't be able to sing again," says Becky, who is planning an album of Christmas songs and wants to pursue a doctorate in music. "Mayo Clinic is simply the only place in the region that can fix and rehabilitate a singing voice." Learn more about voice disorders. Read about voice disorder care at Mayo Clinic.